A blog for those interested in radio, DX-ing and broadcasting. The name of Leonard F. Plugge may not be very well known amongst radio enthusiasts today. Yet he was a pioneer in the early days of European broadcasting, especially in the commercial use of this new medium. He effectively started as a DX-er (although this term was not yet invented in the 1920s). By using a simple crystal receiver he tuned in to several European stations and started publishing their schedules and details of their transmissions. What started off as a hobby evolved into a full time occupation and thus the IBC (the International Broadcasting Company) saw the light of day. Plugge initiated the first commercial broadcast ever directed at a British audience from another country and this programme was a fashion show, transmitted by the station in the Eiffel Tower of Paris. This programme was sponsored by Selfridges in London. Later Plugge would travel around Europe in his car, equipped with state of the art receiving equipment which was most unusual in the 1920s and 30s. During one of these travels he met another radio enthusiast in the French village of Fécamp, Fernand Le Grand, who had established a local medium wave station for the area. The gentlemen connected instantly and from this a new station was born, Radio Normandie. A station which in the 1930s would become extremely popular with the British radio listening audience as the light programmes were seen as a very popular alternative to the output of the BBC. IBC also contracted a large number of European broadcasting stations for carrying their commercial programmes. Captain Plugge made several travels across Europe in order to check reception of the stations and he often broadcast directly from stations which he visited during his trips. The book contains much of interest for others than radio buffs. The detailed reports about his travels across Europe give a very good picture of the meeting between different cultures in those early days. Plugge also visited Sweden during his travels and was then shown the radio stations in Stockholm and Malmö. He was a central figure of the jet set of the day and the book tells about many interesting anecdotes. Not to mention that those interested in vintage cars should find much of interest in this biography. The book includes 165 illustrations and also contains detailed schedules of the IBC broadcasts over various European stations. It is a most interesting piece of work which tells of a hitherto little documented period in the history of European broadcasting. In addition, it is written in a very entertaining and inspiring way. 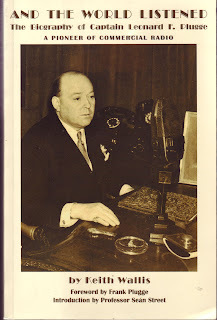 The story of L F Plugge gives a fascinating insight into the life of a man who was active in many areas but who had a profound passion for radio. Eventually the IBC would concentrate on other things and at the last years of his life, Plugge lived under very limited economical circumstances as a contrast to all the lavish parties of bygone years. But he was indeed one of the true pioneers in broadcasting and this book is a welcome piece of radio history. Highly recommended. Similar to L F Plugge, Keith Wallis is a man of many interests and talents. Soon in his 80s, he is after his retirement very busy writing books. One of his many interests is gemstones and he is a Fellow of the Gemmological Association of Great Britain. He has also written a book on the subject: Gemstones : understanding, identifying, buying. His interest of radio and Captain Plugge started by a very unexpected find.In the early 1950s Keith Wallis was working as a consulting engineer in a building behind the IBC at Portland Place in London. During this work he found a lot of lanternslides plus a manuscript of a journey by a car equipped with radio through Europe. He took the material home and for many years it was gathering dust in the attic. When many years later he heard a feature on Radio Normandy by the BBC, he got in touch with the programme producer to tell him of his material. This led to contacts with people who had been involved in the IBC and Radio Normandy and during one interview somebody asked him if he were writing a book. “Yes, why not” he thought – and the rest, as they say, is history. Several years of research lies behind this book and one of the big obstacles was finding a publisher willing to publish the book. Eventually, the small company Kelly Publications, which is focused on radio related material, dediced to release the book. Keith Wallis isn’t really a radio aficionado as such although he has always been very interested in the history of musical theathre. He tells over the phone that he generally listen very little to radio, mainly because the output for a mature audience is very limited. Yes, nothing special for Great Britain, as we all know…. 1350 18.3 0320 HCYP2 Teleradio Guayaqil ”en AM y Digital” dominerar nu. 1360 18.3 0500 HJTL Oxigeno 1360 Cartagena lika snett som vanligt. I´ve just returned from Fredriksfors.It´s spring! A beautiful day. The sky is all blue, almost no wind and several degrees abouve zero. The night in Fredriksfors was also just great with all the stars.We really need this.As a radio enthusiast it´s not that great.I just got the information that one of the last foreign broadcasters with programs in Swedish will stop that service March 27th: Radio Moskva. It´s a pity.And the weather is far more fantastic than how the radio signals propagated this night.In the evening the philippino on 1314 DWXI and Japanese JOIF 1413 came through. Later some of the most common NA-stations from the east coast and some Puerto Ricans.In the morning there were far more stations and also much stronger signals. But still, I felt as it was the usual and wellknown stations with very few surprises.In the lower part of the band there were lots of Cuban stations and some of the stronger ones from Venezuela and Colombia. In the upper part of the band also some North American stations from the east coast came through.I spent much time on 1200 kHz and have some time recordet there for further checking, but I´m afraid that it is only CFGO and Radio Tiempo there. But a slight hope of something more...However, signals were still propgating, many at quite decent strength, a good time after 07 UTC, more than two hours after sunrise. WCRA 1330 seems to be having a great period at the moment. New transmitter or aerial? I suppose it should be counted as a new station by now??? On 1490 there was a short spell of gospel, otherwise probably just Punto Cinco when anything at all was heard. A "bad night" in Fredriksfors, besides of nice weather (about 0 C.) and the already warm building, as Dan and Rolf were "on duty". That´s the nice part of it. The radio didn´t give much plesant to record and remember. WWNN 1470, Pompano Beach was a little surprising at about 23.30 (UTC) - the best signal from the continent! In the morning I listened from 03 UTC. Almost "only" Spanish speaking stations, and as far as I recognised only those you always expect to hear. 1350 could be the exception, but probably it was WEGA, PR that took over from earlier dominant Ciudad del Mar, Cuba. Something to check anyhow. Rebelde on 1550.
time (short before 07) some NA-stations came through, but then with a low signal and for quite a short time. Short after 07 most of the signals were gone. Welcome to the Radio Shack blog! 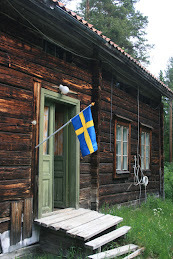 We are some radio enthusiasts who share a DX shack in Hälsingland, some 350 km's north of Stockholm. Most of us are members of both Delsbo Radioklubb and the Arctic Radio Club (which specializes in broadcast band/MW DX-ing) and we will publish loggings, news and other radio related items here. Contributions are highly welcome - just mail info@rock.x.se if you would like to share any news or loggings. And please feel free to leave a comment.